I have a lot of meatball recipes on this here site. Did you know that? I kind of like to think I’m one with the meatball. My kids devour them. They make us all very happy. And happy is a good thing at dinnertime. I know you know what I mean. However, I realized in dismay the other day that it’s been a shocking amount of time since I posted a new meatball recipe. Shame on me! I’m here today to redeem myself and I’m telling you, this is a doozy (in a good way). Totally different than the other meatball recipes I’ve posted, this green curry Thai-style version is crazy delicious. 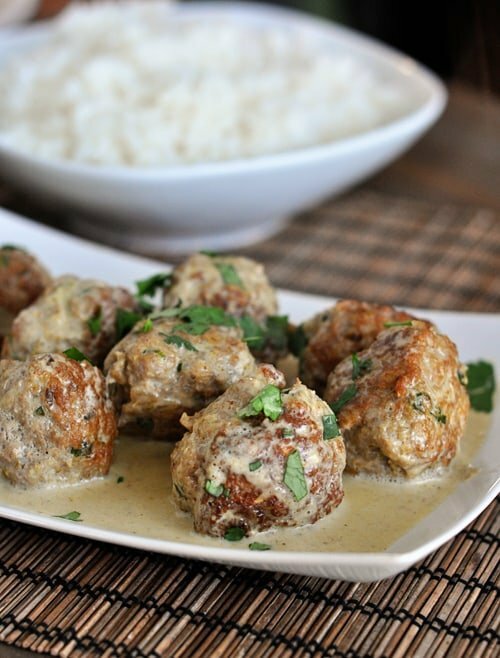 A quick homemade meatball is browned and then simmered in a green curry coconut milk sauce. It’s simple. It’s flavorful. It’s different. It’s amazing. Served with rice (or better yet, coconut rice) and you’ve got yourself a stellar meatball meal! And we all know by now that coconut milk in main dish fare is a surefire way to win room in my food-loving heart. 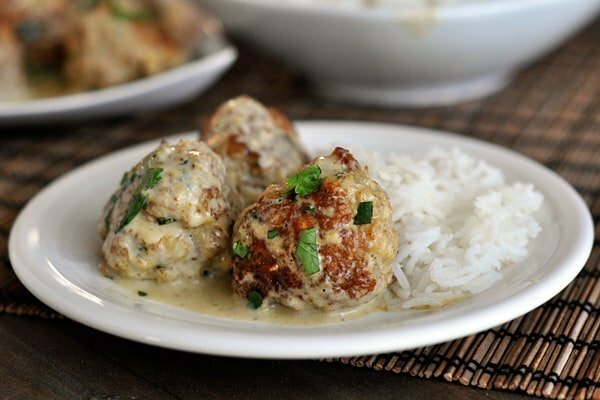 These green curry meatballs are welcome in my home any day, any time. In a large bowl, combine the eggs, oats and milk. Let the mixture stand and soak for 5-10 minutes. Add ground beef or turkey, ginger, curry paste, fish sauce, sugar, cilantro, salt, garlic and green onions. Mix to combine and distribute all the ingredients through the meat. Shape the meat mixture into meatballs, a bit smaller than golf ball size. Heat the oil over medium heat in a large, 12-inch nonstick skillet. When the oil is hot, place one layer of meatballs in the pan leaving a little room in between each meatball (it's ok if you can't fit them all in; they'll cook in batches). Brown the meatballs on all sides, about 2-3 minutes total. They don't need to be cooked through - just golden and browned. Remove the meatballs to a plate and do the same with the remaining uncooked meatballs (adding more oil to the pan if necessary - let it get hot before adding the meatballs to brown). Once the last batch of meatballs has been removed to a plate, drain any excess grease from the pan (but leave the goldeny browned cooked bits). Return the skillet to medium heat and stir in the coconut milk and green curry paste, scraping up any browned bits from the bottom of the pan and stirring into the sauce. Place the meatballs in the skillet with the sauce. Go ahead and pile them all in, trying for a single layer. Simmer the meatballs and sauce for 8-10 minutes until the meatballs are cooked through, flipping the meatballs once or twice. Stir in the lime juice. Add salt and pepper to taste. Serve over hot, cooked rice. Green curry paste can vary wildly in spice/heat level so if you want to ensure the meatballs and sauce aren't too spicy, look for a mild green curry paste (or buy one you already like the taste of). The Thai Kitchen brand is the one that Janssen used - her blog is where I got the recipe and she said her young kids gobbled it up. I used the Maesri brand (I have to order any kind of green curry paste online since I can't find it in the stores here; keep in mind I live in a very, very small town) and it was knock-your-socks off hot (but still tasty if you can handle a little heat). Also, a quick note on the sauce - it's fairly thin which we enjoyed because it soaked into the rice; however, if you want it a bit thicker, stir together a tablespoon or so of cornstarch into cold water (about half as much water as cornstarch) and stir it into the simmering sauce until it thickens a bit. This is a family favorite. We make this dish often and have also made it for guests. Never disappoints. You can play around with how much curry you like, really spicy or more savory with a bite. Love it! Wow! This is new a favorite! I’ve known of your site for a long time but just got around to making some of the recipes. I’m totally hooked! This recipe is perfect for me as we always have hamburger on hand and I get tired of (what feels like) the same recipes over and over. Plus we love curry. I just get excited thinking of how good these were! OK now that I have the raving out of the way, I noticed some had a hard time with the balls not holding together. In other meatballs I’ve made I’ve never soaked the oats. And to be honest I just about didn’t do it. I have a (bad) habit of looking at the ingredients and being like, “great I can make this as I have all the ingredients!” and then not reading the instructions until I’m in the process of throwing things in the bowl. So I wonder if you don’t soak the oats if that would really mess up the recipe? OMG these sound amazing! I make meatballs for myself all the time, but my daughter doesn’t like meatballs, burgers, etc. no matter what type of ground meat or seasonings I use. However, I haven’t tried Thai style meatballs. Also, we are more of a Paleo type of family, so we don’t use any flour or milk in the meatballs and they work out just fine. 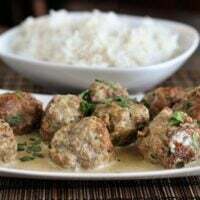 I’ve even done a Swedish style meatball in the oven and they were very tender and stayed in the meatball shape just fine even without any milk or any type of flour. I sometimes add eggs, sometimes don’t. Just depends on how I feel. Also, I base how many eggs I add on how the meat looks/feels when mixing it up. Maybe try adding in just 1 egg and see how it goes, and then adding in another, and so on. We also have grass fed meats, so they are very lean. This recipe sounds like it would make some great, delicious and unique meatloaf. Or turn into burgers with or without the sauce made separately to drizzle onto the burgers (I’d cut it down to just 1 can of coconut milk for that). Really enjoyed these meatballs! I made this tonight but ended up using red curry paste since it was all I had on hand. I used ground beef and chickpea flour (I’m sure any type of flour/oat binder works about the same). I served the meatballs and sauce in a bowl alongside a baked sweet potato. If you haven’t tried it, something about the flavor of red curry and sweet potatoes together is delicious! Mel, I can’t say enough great things about your blog. I’ve been following for several years and you really do a great job offering “tried and true recipes.” Thank you! Made this tonight and it was delish! I did cook my meatballs in the oven, because I was afraid they would fall apart and I wanted more hands off time. I also only added the juice of 1 lime and that was just the right amount. It was so good! Served over brown rice. Next time I may half the sauce recipe, simply because my kids wanted the meatballs plain so I didn’t need quite as much sauce. Quick question…. I made your meatballs and then popped them in the freezer before cooking them. I ended up making a huge batch in prep for a ton of family visitors (like 150). Anyhow…..when I do use them next week, how would you suggest cooking a large batch so that I am not standing at the stove for forever. Could I instapot them or cook them in the oven? I know you need the oily bits to make the sauce. What would you suggest? I would definitely cook a large batch in the oven! 375 degrees for 20-25 minutes or so should do the trick. The sauce won’t be quite the same, but you could use a little olive oil in the skillet and it should be ok. I can’t tell you how many times I have made this recipe. It’s perfect! Oh these were so tasty! So flavorful! My husband really loved them! All of my kids ate them except my youngest who isn’t feeling well today –he kept saying oh that looks good! This is one of my husband’s favorites! Anyone that has baked these will you report back? Just trying to save some time. But I am not sure they would be as good! Yes I baked them & they turned out fabulous! My meatballs also did not form into meatballs =( I don’t know what went wrong. The turkey was not from a tube. It was foster farm’s 85% lean. What can I do next time to make them stay meatballs?? You could try decreasing the liquid and/or adding more binder (like crushed crackers or bread crumbs). I was so excited to make this but mine turned out a total flop! Maybe you have some idea of what I could have done wrong? I have never used ground turkey, and I always make meatballs with breadcrumbs, never tried oatmeal until this time so maybe I’m just not used to the nature of ground turkey and oatmeal… anyway, I didn’t change any measurements or instructions. At the end of the 8-10 minutes of simmering the meatballs had soaked up almost all the liquid and fallen apart into curry meat blobs! When I stirred in the lime juice at the end there was no sauce to really mix it into so the meat balls that were still intact tasted like they had been doused in lime juice. (because they had, haha) Pucker! Anyway, I’d like to try it again but not sure if I should try baking the meatballs instead of frying, breadcrumbs instead of oatmeal, any ideas what I’ve done wrong? Hi Kate – what brand of ground turkey did you use? I mentioned in the comments and notes of the recipe that ground turkey in the tube will be really mush – did you use that kind? It sounds like it might be due to the type of ground turkey you used if nothing else was changed in the recipe. I’m sorry they didn’t work out! Hi Mel, I know you don’t have many men visiting your website, but I love some of your recipes. I originally found you by googling “tender grilled pork chops” because my wife had trouble eating pork chops grilled as they were too dry. Now I don’t make pork chops any other way. I made your bbq macaroni salad for a group 2 years ago for my brother’s meat fest he has day before father’s day every year – big hit! I am going again to meat fest this year and I am going to bring these thai curry meatballs… but I may use bison. Thanks, Patrick! Happy you are loving the recipes and I think the meatballs with bison sound delicious. Should I use old-fashioned oats or quick-cooking oats? I’ve never used oats in this way before!! Our grocery store was out of ground turkey so I will be making this with ground chicken this week. I can’t wait to try it – I love Thai green curry! Dani – I think either could work here but the meatballs are pretty wet so quick oats might be the better choice for a binder. Okay, great, thanks! I’m making this tonight. Made your Buttermilk Drop Biscuits with a slow cooker chicken stew the other night and they were wonderful! Are there different kinds of canned coconut milk? I’m wondering if I used the wrong kind of coconut milk. My sauce turned out very thick — it had a pleasant flavor when tasting it on its own, but the sauce seemed too “heavy” and viscous with the meatballs. Also, my meatballs crumbled apart and got mushy in the sauce very quickly. 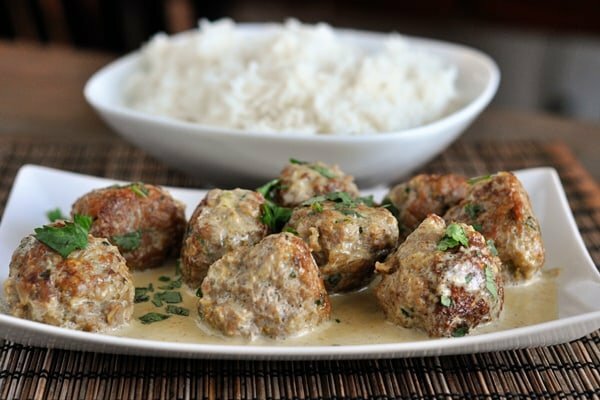 I followed the recipe exactly — I’m trying to figure out how my Thai Meatballs turned out so differently from the delicious ones that your other followers are raving about. Any advice for me so I can try the recipe again? I’m not sure, Sophie, especially if you made it exactly like the recipe. I usually use lite coconut milk which doesn’t have as much of the heavy creaminess as regular coconut milk but I’ve used both kinds successfully in this recipe. If your meatballs weren’t holding together, you might try adding less moisture to them or more dry ingredients. Hi Mel, My question is do you think the sauce could be mixed in a crockpot and then add the uncooked meatballs and cooked that way? I just ask b/c I do this with homemade Italian meatballs and sauce and they turn out yummy. I’m just not sure about simmering coconut milk over a longer period of time. What do you think? PS We love all of your recipes that we’ve tried. Thanks so much! I’m not sure either since I’ve never tried it but it’s definitely worth experimenting. Good luck if you try it. My kitchen smelled like an authentic Thai restaurant last night. Loved these! I found the Thai brand for the green curry paste, and it was labeled “hot” with three chili peppers, but it wasn’t hot at all. Like, my one year old was able to eat them, they were that mild. Kob kun kaa! I made these a few nights ago….I always thought meatballs were labour intensive and I kind of steered away, but after making these I’m sold!! I did use red thai curry paste as I had it on hand and reduced the amount of beef (I’m still eating the leftovers gladly) and made it with Jasmine rice and seriously tasty. I love that I’ll make this again, I could serve to guests and the way the whole house smelled off Thai goodness!! Thanks for the awesome recipe!! Just made these- amazing! Flavours were great and so easy! Made this tonight for dinner and they were so delicious!!! I halved it because it’s only me and made the following modifications to my halved recipe (so, you’d double these for the original recipe): rounded down to 1 egg and used 1 tsp fish sauce in my meatballs. Added 1/4 c. milk to the sauce to thin it out a bit & 1/4 tsp salt to the sauce to flavor it. Next time I would add some sliced red bells and onions into the sauce (maybe even a tiny can of bamboo shoots) 2-3 min before the meatballs are done, so they still have a bit of a crunch. Didn’t care for this recipe. Way too much oatmeal took away from flavor of the meatballs. Lacked flavor despite all the ingredients. If I make again, would use small amount of bread instead of oatmeal and add fresh chili peppers for some kick. This dish was beyond amazing! With all the garlic, ginger, green onion and cilantro in them I don’t understand how anyone could think the meatballs lacked flavor. This is the first time I tried using oatmeal as a binder and I was pleasantly surprised. The meatballs held together perfectly and browned beautifully. If anyone is looking for flavor without any heat I would recommend the Thai Kitchen green curry paste. It had absolutely zero heat, but fortunately still had a good flavor. We had enough left over to freeze for two future meals – which I am eagerly looking forward to eating! Maybe I needed to use a different pan? My meatballs fell apart when I tried flipping them so we eventually decided to break them all up into hamburger. Ended up not so good. We did ground pork instead since that seems more thai-ish and it was delicious! Made these tonight and were really tasty. Altho, like other folks have mentioned, these were REALLY wet, and I even omitted the fish sauce b/c I don’t care for it. I was completely unable to form a meatball shape, so they were basically turkey sliders with a sauce over them. The flavor was great … so I wonder it is has something to do with the type of ground turkey. I did NOT buy 100 percent turkey breast, so there was extra fat in the meat. Hmmmmm. I will try again with one less egg and just a TBSP of milk maybe. Served this over linguine rice noodles. Used crushed rice crackers and coconut flour instead of oats. I also stir fried up some green pepper and onion and added it into the dish. Topped with some Thai Basil leaves. Fantastic! Mel, you are fantastic, and my family seriously wouldn’t eat anything but cereal and pizza if it weren’t for you. So Thank You! I hate to say it, but this was just a little too tangy and sweet for my taste. Otherwise I really enjoyed it. If I could find a way to cut back on those two things, I would make this dish all the time. Definitely glad that we tried it though. These were OK. I was expecting knock your socks off flavor, but found the meatballs lacked flavor. The sauce was good. This won’t be made again though. Too much work for an OK meal. I do have your lime tart in my fridge right now for dessert tomorrow and about died when I licked the spoon after finishing the filling. I might have found my new fav dessert. We will have to see tomorrow…can’t wait! Have been dying to try these and I finally made them tonight. Meatballs were flavorful and unbelievably tender. The sauce was bland to me (initially) but think it was the Green Curry paste I bought (Taste of Thai) reviews I read said so but it was all I could get at the store so I just added tons of fresh ginger, garlic and lemongrass paste to the sauce, a good amount of Siracha and it may seem crazy but about 1/3rd of a jar of Mango butter from Trader Joes – Lick the bowl clean good!!! Your picture sold me – had me craving this for a couple weeks – thanks for sharing! Can these be baked in the oven instead? Christina – I haven’t baked them but I”m sure with a little tweaking, it could work. You’ll have to experiment with time and temperature. I’m making this tonight and forgot to buy cornstarch… Would flour work? Or would that ruin it? Liz – you’ll have to experiment but flour should help thicken as long as you make sure it doesn’t clump. For other gravies, I whisk together flour and broth until it is smooth and thick and then slowly whisk into the boiling gravy. I made this tonight. It was fabulous. I substituted Thai Basil for the cilantro, since I cant stand cilantro. The green curry paste brand I used was Mae Ploy. The sauce was a bit spicy for my son using the 3 tblsp, of curry paste, so next time I will only use 2. This was an incredible dinner. Thank you sooooooo much I will definately make this again. These were sure a hit at my house last night! I”m wondering how much “heat” this has. (coming from a spice wimp) I sampled the green curry paste I just bought and it seemed really spicy. Does the coconut milk help counteract that a bit? I just hate when I make a recipe and then none of my kids will eat it because it’s too hot. Thanks in advance…love your site! Yummy can’t wait to try! Do use raw or cooked oatmeal? Cindy – I use uncooked oatmeal. I bought Fish Sauce and tasted it. I was shocked that it tasted kind of like Soy Sauce and didn’t taste fishy. This meal was a hit! Thank you! Hey Miss Sally – I’m a ground turkey lover so I prefer that almost always over ground beef for it’s lightness in taste and texture! Thanks for the great recipe…it’s going into my favorites! I made it tonight, and it was awesome! Ethan and Olivia approved. I used Roland brand thai green curry paste, great flavor and not hot. Made these and loved them. I used red curry paste (I also use Maesri brand) since that’s all I had on hand and left out the fish sauce and green onions. They were delicious, except I wanted a bit more sauce, so next time I’ll increase those ingredients. Meg, I used light coconut milk and it was just fine. Mel, like Christine, my meatballs were not round, so any help would be appreciated. I almost felt like they had a bit too much liquid so I may try no milk. Christine and Sheree – hmmm, I don’t know if I have a top secret method for round meatballs. Mine aren’t perfect spheres by any means but they do hold their shape. If your meatball mixture seems overly wet and won’t hold it’s shape because of the texture, like Sheree says, try cutting out some liquid. That should help considerably. Other than that, the only thing that may help is I brown them quite a bit on the first side before flipping so that they have a nice golden “shell” to help keep them together. Do you think light coconut milk would be okay with this, or would it be better to stick to the regular as you say the sauce is thin as it is? BTW, recipes from your site are showing up regularly on our table these days, and, generally, to rave reviews. Thanks. Hi Meg – I think light coconut milk would work just fine. You can always add the cornstarch slurry (in the note of the recipe) if you want the sauce to thicken). P.S. – so happy you are enjoying the recipes! These were delicious. We added some sriracha on top of them to kick up the heat a bit. I think I might add the mushrooms back in, for a bit more earthiness…and maybe increase the garlic, or roast it a bit to pull more flavor out of it. One big problem we had, that I notice YOU seem to have kicked, is the ROUND meatball. Ours turn out…weird. Tasty but not pretty. Any special tips or tricks to making (and keeping) meatballs ROUND while you’re browning them? Made these, love these! I also think I might try some oatmeal or ground oatmeal in the turkey cheddar jalapeno burgers as those were a bit too wet. The texture of these was just right! Wow. I love this twist on meatballs. Such a great thing to serve the kids – I have never found a meatball mine don’t like. I crave Thai flavors so this will definintely be on the menu at my house. I just have to tell Katie that we love “cauli-rice” too! It’s especially good with dishes that have a sauce since it just soaks up the flavor. It’s a healthy way to cut down on carbs. I cook it in the microwave in a covered dish for about 5 minutes. Do I have to add the fish sauce? I have eaten some Asian food that had it in it and it tasted like they added rotted fish. So can you taste that fishy flavor in the meatball’s? Hi Tara – I don’t mind a bit of fish sauce here and there so for me, it just adds great flavor. If you really hate it, leaving it out shouldn’t be a problem. I don’t think it’s overpowering in this recipe, though. I can’t tell you what a rockstar this makes me feel like. Seriously, the best kind of Friday. Hey this was fun Janssen, I feel kind of like a rockstar that I know you! We love meatballs and we love all things Thai style! Thanks for sharing! Looking forward to trying this recipe. Just bought a huge tube of green curry paste. It will be great to make something besides the Thai classics. I must recommend Mae Ploy as the best brand of curry paste out there. If you use them to make Thai curry, you will be blown away at how similar it tastes to a Thai restaurant’s curry. They are made in Thailand, so totally legit (and pretty darn spicy, too). I’ve never had the green, but I love the red and panang, and I’ll be trying yellow soon…from Amazon, since I’m also in a small town. They’re also not too expensive. If you have Prime, you pay around 6 bucks for 14 oz., which lasts a looong time. We had your teriyaki meatballs last night and LOVED them! These look great! Could red curry paste be substituted for the green curry paste? I’ve been wanting to make a Thai inspired meatball for quite some time. This looks perfect! These just sound so yummy and unique! I am new to thai/curry”ness” and am starting to fall in love! Just curious, I notice you make rice alot. Our family recently discovered (thanks to againstallgrain.com new cookbook) cauliflower rice..stick with me. Grate to rice like consistency, saute, you can add a plethora of flavors..my fav being cilantro lime! My 8 yr old told me that it was the best “rice” he’d ever had!! And we’ve never looked back. Love this meatball recipe! I’ve been in a bit of a dinner rut so I can’t wait to put these on our next meal plan! We’ve really enjoyed your home cooked Thai food recipes around here. I really like to serve veggies with meals. Since this is a new flavor profile I am never sure what to serve. Any suggestions??? Hi Rachael – when we make Indian or Thai food, we very often serve it with cauliflower (steamed or roasted), broccoli, green beans and many times just simply steamed green peas. Hope that helps! Can these be frozen – a make ahead meal? Sharing – I haven’t tried freezing this recipe so you’ll have to experiment. I love meatballs too. Since I’m fairly new here, I’ll have to try finding some of your other meatball recipes. This one is definitely on the list to try. I made these after I saw them on Janssen’s site and agree they are awesome! Definitely a favorite in these parts. Oh, I love Thai food! I have been looking for a new and interesting meatball recipe…I found it! These look amazing, and I always have Thai red and green curry in my fridge. Thanks, Mel!